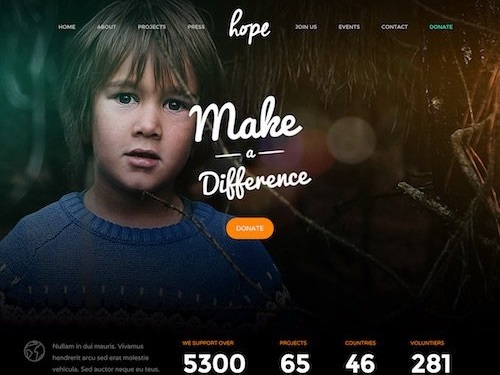 Hope is a charity WordPress theme designed for non profits and organizations. The Hope theme is a purpose built child theme included with the powerful multipurpose The Core from ThemeFuse. It has a modern and gorgeous design and all the features and functionality you need to showcase your projects and work as well as accept donations. Some of the key features and benefits of the Hope and The Core include: integration of the popular Give plugin (so you can accept donations), advanced visual page builder (drag and drop the design elements you want), mobile friendly responsive design, WooCommerce ready, multiple sliders, color scheme customisation options, multiple layouts, mega menu, all Google fonts, events management, animations, projects and portfolio, sticky header, header and footer options, and much more. 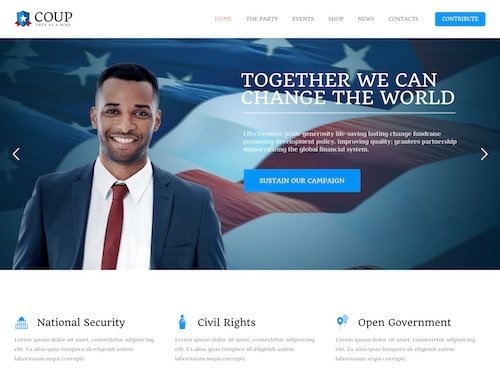 Coup is a political campaign WordPress theme from Tesla Themes. The premium theme is designed for politicians, political candidates, and political party websites. It would also be suitable for charity and non profit websites, churches and other organizations. Some of the key features and benefits of the Coup theme include: a clean and professional mobile friendly design, integrated donation form, two layout options (boxed and full width), slider, advanced theme options panel, parallax and video backgrounds, multi-pin Google map, visual composer (for custom page layouts), shortcodes, WooCommerce support, unlimited color options, translation ready and more. 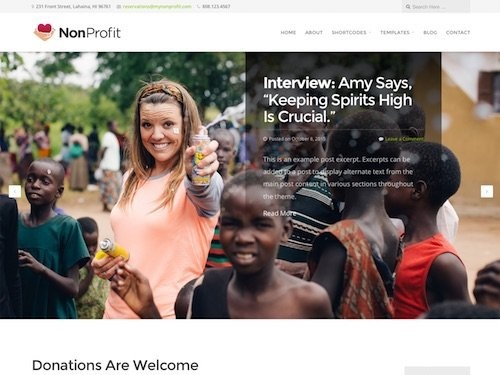 The Non Profit Theme from Organic Themes is a modern and professional WordPress theme designed for charities, non-profit organizations, environmental groups, and socially responsible businesses. It has a great looking, clean and contemporary design and is mobile friendly with a responsive layout. 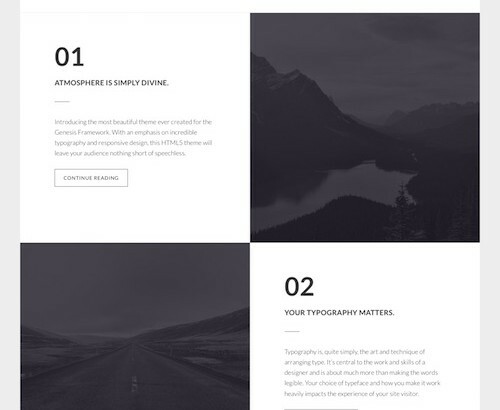 Some of the other key features of the theme include: a donation link option, project page template, slideshow page template, business contact information, retina optimization, a variety of page templates, customization options, multiple sidebars, shortcodes, featured videos, JetPack, WooCommerce and Gravity Forms compatibility, Google fonts, and more.